Arya Stark Is Coming To Doctor Who! Yes, you read that right — one of Westeros' most beloved stars is going far beyond Game of Thrones and into time and space. 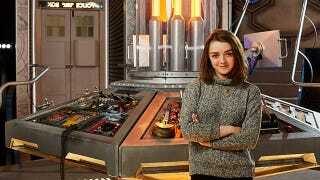 Arya Stark's in the TARDIS! The BBC have announced that Maisie Williams, who is of course known for her role as all-round badass Arya Stark on Game of Thrones, will guest star on the ninth series of Doctor Who, which is currently filming ahead of its return later this year. We're thrilled to have Maisie Williams joining us on Doctor Who. It's not possible to say too much about who or what she's playing, but she is going to challenge the Doctor in very unexpected ways. This time he might just be out of his depth, and we know Maisie is going to give him exactly the right sort of hell. It's not too much to hope that, Game of Thrones filming schedule be damned, she returns as the companion at some point, right? Actually, screw it, just make her the next Doctor. It's not like being a guest star has ruled that out before.